The secret to baking the perfect muffin is to mix the mixture as little as possible. After combining the liquid with the dry ingredients, stirring just enough to moisten, the batter should still be lumpy. One of my oldest and possibly my favourite recipe books states that “over-mixing the batter will destroy the light texture of the muffins and can result in tough, coarse muffins that contain tunnels”. And who wants tunnels? I love muffins. They can be as big or as small as your muffin pans will allow and the basic mixture is so versatile, the options are virtually endless and limited only by your imagination. 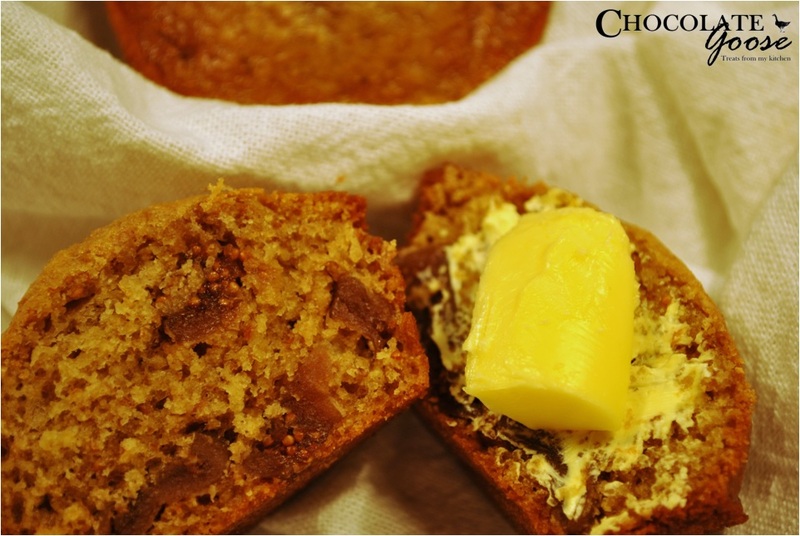 Whether sweet or savoury, few can resist the smell of freshly baked warm muffins direct from the oven. The beauty of this particular recipe is evident in the name: this batter can literally be stored for 30 days in an air-tight container in the fridge, but I predict that you won’t be able to make the mixture last that long as you’ll want to use it all in a week. Fresh muffins for breakfast have certainly never been easier. The recipe calls for the batter to be left in the fridge overnight before baking, but I’ve found this isn’t absolutely necessary. Today I decided to add chopped dried figs as I love figs but you can replace with an equal quantity of fruit cake mix or pitted dates, sultanas, raisins or a few walnuts or pecan nuts. If you do decide to bake them all in one go and then have a few leftovers, they can be individually wrapped in tin foil or packed into freezer bags and frozen for up to three months. Great for lunch boxes – remove the foil and pop into the lunch box. It will have defrosted by lunch time. If baking immediately, preheat the oven to 180°C (350°F). Using a hand/bulb whisk, whisk the eggs, oil and sugar together. Spoon into well-greased muffin tins or use baking cups, filling each two-thirds full. If storing the mixture in the fridge overnight, then follow steps 2 and 3 before transferring to an airtight container and into the fridge.